For Eucharistic liturgies, see Christian liturgy. For other uses, see Eucharist (disambiguation). "Lord's Supper" and "Most Precious Blood" redirect here. For other uses, see Lord's Supper (disambiguation) and Most Precious Blood (disambiguation). The elements of the Eucharist, sacramental bread (leavened or unleavened) and sacramental wine (or by some grape juice), are consecrated on an altar (or a communion table) and consumed thereafter. Communicants, those who consume the elements, may speak of "receiving the Eucharist", as well as "celebrating the Eucharist". 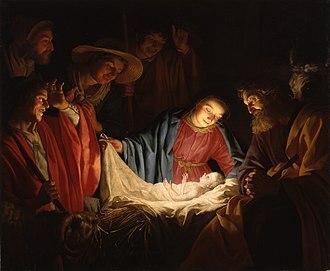 Christians generally recognize a special presence of Christ in this rite, though they differ about exactly how, where, and when Christ is present. While all agree that there is no perceptible change in the elements, Roman Catholics believe that their substances actually become the body and blood of Christ (transubstantiation). Lutherans believe the true body and blood of Christ are really present "in, with, and under" the forms of the bread and wine (sacramental union). Reformed Christians believe in a real spiritual presence of Christ in the Eucharist. Others, such as the Plymouth Brethren and the Christadelphians, take the act to be only a symbolic reenactment of the Last Supper and a memorial. The term "Eucharist" (thanksgiving) is that by which the rite is referred to by the Didache (late 1st or early 2nd century), Ignatius of Antioch (who died between 98 and 117) and Justin Martyr (writing between 147 and 167). Today, "the Eucharist" is the name still used by Eastern Orthodox, Oriental Orthodox, Roman Catholics, Anglicans, Presbyterians, and Lutherans. Other Protestant or Evangelical denominations rarely use this term, preferring either "Communion", "the Lord's Supper", "Memorial", "Remembrance", or "the Breaking of Bread". Latter-day Saints call it "Sacrament". 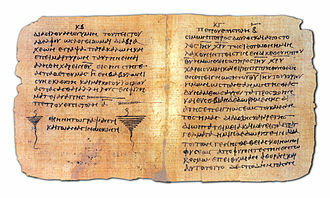 The phrase (Greek: κλάσις τοῦ ἄρτου klasis tou artou "breaking of the bread"; in later Greek liturgical language also ἀρτοκλασία artoklasia) appears in various related forms five times in the New Testament (Luke 24:35; Acts 2:42, 2:46, 20:7 and 20:11) in contexts which, according to some, may refer to the celebration of the Eucharist, in either closer or symbolically more distant reference to the Last Supper. It is the term used by the Plymouth Brethren. The "Blessed Sacrament" and the "Blessed Sacrament of the Altar" are common terms used by Catholics, Lutherans and some Anglicans (Anglo-Catholicism) for the consecrated elements, especially when reserved in a tabernacle. "Sacrament of the Altar" is in common use also among Lutherans. In The Church of Jesus Christ of Latter-day Saints the term "The Sacrament" is used of the rite. Mass is used in the Latin Rite of the Catholic Church, the Lutheran Churches (especially in the Church of Sweden, the Church of Norway, the Evangelical Lutheran Church of Finland), by many Anglicans (especially those of an Anglo-Catholic churchmanship), and in some other forms of Western Christianity. At least in the Catholic Church, the Mass is a longer rite which always consists of two main parts: the Liturgy of the Word and the Liturgy of the Eucharist, in that order. The Liturgy of the Word consists mainly of readings from scripture (the Bible) and a homily preached by a priest or deacon and is essentially distinct and separate from the Sacrament of the Eucharist, which comprises the entirety of the Liturgy of the Eucharist, so the Eucharist itself is only about one half of the Mass. 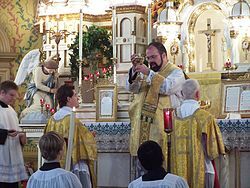 (It is also possible and permissible in the Latin Rite for a priest to consecrate and distribute the Eucharist outside the ritual structure of the Mass—such an event is often called a communion service—but it is much more common to celebrate a full Mass.) Among the many other terms used in the Catholic Church are "Holy Mass", "the Memorial of the Passion, Death and Resurrection of the Lord", the "Holy Sacrifice of the Mass", and the "Holy Mysteries". The term mass derives from post-classical Latin missa "dismissal", found in the concluding phrase of the liturgy, "Ite, missa est". The term missa has come to imply a 'mission', because at the end of the Mass the congregation are sent out to serve Christ. The term Divine Service (German: Gottesdienst) is used in the Lutheran Churches, in addition to the terms "Eucharist", "Mass" and "Holy Communion". The term reflects the Lutheran belief that God is serving the congregants in the liturgy. 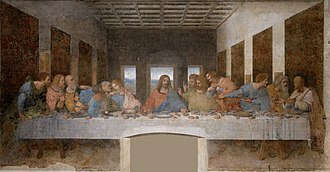 The Last Supper appears in all three Synoptic Gospels: Matthew, Mark, and Luke. 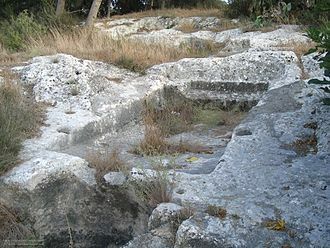 It also is found in the First Epistle to the Corinthians, which suggests how early Christians celebrated what Paul the Apostle called the Lord's Supper. Although the Gospel of John does not reference the Last Supper explicitly, some argue that it contains theological allusions to the early Christian celebration of the Eucharist, especially in the chapter 6 Bread of Life Discourse but also in other passages. In his First Epistle to the Corinthians (c. 54–55), Paul the Apostle gives the earliest recorded description of Jesus' Last Supper: "The Lord Jesus on the night when he was betrayed took bread, and when he had given thanks, he broke it and said, 'This is my body, which is for you. Do this in remembrance of me. '[1 Cor. 11:23–25] Those interested might note that the Greek word for remembrance is ἀνάμνησιν or "anamnesis", which itself has a much richer theological history than the English word for "remember". The synoptic gospels, Mark 14:22–25, Matthew 26:26–29 and Luke 22:13–20, depict Jesus as presiding over the Last Supper prior to his crucifixion. The versions in Matthew and Mark are almost identical, but Luke's Gospel presents a textual problem in that a few manuscripts omit the second half of verse 19 and all of v.20 ("given for you … poured out for you"), which are found in the vast majority of ancient witnesses to the text. If the shorter text is the original one, then Luke's account is independent of both that of Paul and that of Matthew/Mark. If the majority longer text comes from the author of the third gospel, then this version is very similar to that of Paul in 1 Corinthians, being somewhat fuller in its description of the early part of the Supper, particularly in making specific mention of a cup being blessed before the bread was broken. 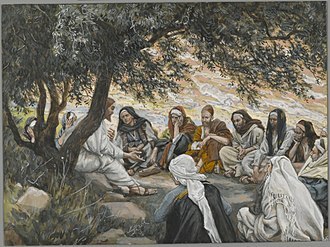 Uniquely, in the one prayer given to posterity by Jesus, the Lord's Prayer, the word epiousios—which does not exist in Classical Greek literature—has been interpreted by some as meaning "super-substantial", a reference to the Bread of Life, the Eucharist. In the gospel of John, however, the account of the Last Supper does not mention Jesus taking bread and "the cup" and speaking of them as his body and blood; instead, it recounts other events: his humble act of washing the disciples' feet, the prophecy of the betrayal, which set in motion the events that would lead to the cross, and his long discourse in response to some questions posed by his followers, in which he went on to speak of the importance of the unity of the disciples with him, with each other, and with the Father. Some would find in this unity and in the washing of the feet the deeper meaning of the Communion bread in the other three gospels. In John 6:26–65, the evangelist attributes a long discourse to Jesus that deals with the subject of the living bread and in verses 52–59 contains echoes of Eucharistic language. The interpretation of the whole passage has been extensively debated due to theological and scholarly disagreements.[why?] Sir Edwyn Hoskyns notes three main schools of thought: (a) the language is metaphorical, and verse 63: "The Spirit gives life; the flesh counts for nothing. The words I have spoken to you—they are full of the Spirit and life" gives the author's precise meaning; (b) vv 51–58 are a later interpolation that cannot be harmonized with the context; (c) the discourse is homogeneous, sacrificial, and sacramental and can be harmonized, though not all attempts are satisfactory. The expression The Lord's Supper, derived from St. Paul's usage in 1 Cor. 11:17–34, may have originally referred to the Agape feast (or love feast), the shared communal meal with which the Eucharist was originally associated. 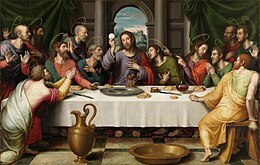 The Agape feast is mentioned in Jude 12 but The Lord's Supper is now commonly used in reference to a celebration involving no food other than the sacramental bread and wine. Ignatius of Antioch (born c. 35 or 50, died between 98 and 117), one of the Apostolic Fathers,[note 4] mentions the Eucharist as "the flesh of our Saviour Jesus Christ",[note 5] and Justin Martyr speaks of it as more than a meal: "the food over which the prayer of thanksgiving, the word received from Christ, has been said ... is the flesh and blood of this Jesus who became flesh ... and the deacons carry some to those who are absent." Paschasius Radbertus (785–865) was a Carolingian theologian, and the abbot of Corbie, whose most well-known and influential work is an exposition on the nature of the Eucharist written around 831, entitled De Corpore et Sanguine Domini. He was canonized in 1073 by Pope Gregory VII. His works are edited in Patrologia Latina vol. 120 (1852). Most Christians, even those who deny that there is any real change in the elements used, recognize a special presence of Christ in this rite. But Christians differ about exactly how, where and how long Christ is present in it. Roman Catholicism, Eastern Orthodoxy, Oriental Orthodoxy, and the Church of the East teach that the reality (the "substance") of the elements of bread and wine is wholly changed into the body and blood of Jesus Christ, while the appearances (the "species") remain. The Orthodox use various terms such as Transelementation, but no 'explanation' is official as they prefer to leave it a mystery; transubstantiation is rejected as a philosophical definition and suspect because of the idea of substances smacks of magic. 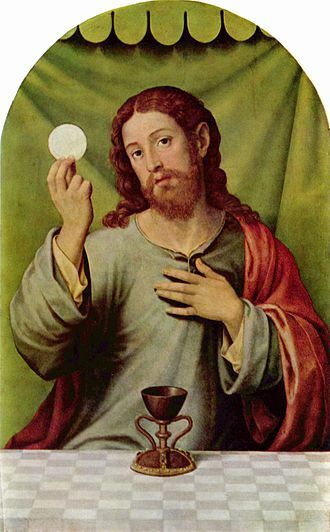 Transubstantiation (change of the reality) is the term used by Catholics to denote what is changed, not to explain how the change occurs, since the Roman Catholic Church teaches that "the signs of bread and wine become, in a way surpassing understanding, the Body and Blood of Christ". Lutherans and Reformed Christians believe that the whole Christ, including the body and blood of Jesus, are present in the supper, a concept known as the sacramental union. Lutherans specify that Christ is "in, with and under" the forms of bread and wine. Anglicans adhere to a range of views although the teaching in the Articles of Religion holds that body of Christ is received by the faithful only in a heavenly and spiritual manner. 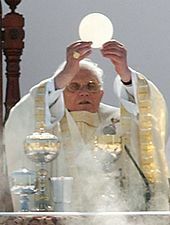 Some Christians reject the concept of the real presence, believing that the Eucharist is only a ceremonial remembrance or memorial of the death of Christ. Many Christian denominations classify the Eucharist as a sacrament. Some Protestants (though not all) prefer to instead call it an ordinance, viewing it not as a specific channel of divine grace but as an expression of faith and of obedience to Christ. In the Catholic Church the Eucharist is considered as a sacrament, according to the Church the Eucharist is "the source and summit of the Christian life." "The other sacraments, and indeed all ecclesiastical ministries and works of the apostolate, are bound up with the Eucharist and are oriented toward it. For in the blessed Eucharist is contained the whole spiritual good of the Church, namely Christ himself, our Pasch." In the Eucharist the same sacrifice that Jesus made only once on the cross is made present at every Mass. According to Compendium of the Catechism of the Catholic Church "The Eucharist is the very sacrifice of the Body and Blood of the Lord Jesus which he instituted to perpetuate the sacrifice of the cross throughout the ages until his return in glory. Thus he entrusted to his Church this memorial of his death and Resurrection. It is a sign of unity, a bond of charity, a paschal banquet, in which Christ is consumed, the mind is filled with grace, and a pledge of future glory is given to us." For the Catholic Church the Eucharist is the memorial of Christ's Passover, the making present and the sacramental offering of his unique sacrifice, in the liturgy of the Church which is his Body... the memorial is not merely the recollection of past events but ... they become in a certain way present and real. When the Church celebrates the Eucharist, she commemorates Christ's Passover, and it is made present the sacrifice Christ offered once for all on the cross remains ever present. The Eucharist is thus a sacrifice because it re-presents (makes present) the sacrifice of the cross, because it is its memorial and because it applies its fruit. However, as modern historical and Biblical studies have shown, using the word "propitiation", while it was St. Jerome's translation of the Vulgate, is misleading for describing the sacrifice of Jesus and its Eucharistic remembrance. The General Instruction of the Roman Missal recalls that the Council of Trent had no historical studies on the liturgy from before the Middle Ages, but that since then there has been continuous progress that has shed light on the theology of the Eucharist. One expression of the conclusion of theologians is that sacrifice "is not something human beings do to God (that would be propitiation) but something which God does for human kind (which is expiation)." "Living for others" is the very essence of Christ's sacrifice. Not in ritual sacrifice but in personal self-giving Jesus offers himself to God in handing himself over to men. The Catholic Church teaches that Jesus is present in a true, real and substantial way, with his Body and his Blood, with his Soul and his Divinity under the Eucharistic species of bread and wine, Christ whole and entire, God and Man. During the consecration of bread and wine, both bread and wine become the body and blood of Jesus Christ. The change of the whole substance of bread into the substance of the Body of Christ and of the whole substance of wine into the substance of his Blood is called transubstantiation. This change is brought about in the eucharistic prayer through the efficacy of the word of Christ and by the action of the Holy Spirit. 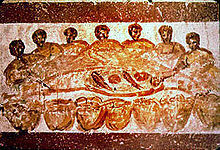 However, the outward characteristics of bread and wine, that is the “eucharistic species”, remain unaltered. The presence of Christ continues in the Eucharist as long as the eucharistic species subsist. that is, until the Eucharist is digested, physically destroyed, or decays by some natural process (at which point Aquinas argued that the substance of the bread and wine cannot return). The empirical appearance and physical properties (called the species or accidents) are not changed, but in the view of Catholics, the reality (called the substance) indeed is; hence the term transubstantiation to describe the phenomenon. The Council of Trent declares that by the consecration of the bread (known as the Host) and wine "there takes place a change of the whole substance of the bread into the substance of the body of Christ our Lord and of the whole substance of the wine into the substance of his blood. This change the holy Catholic Church has fittingly and properly called transubstantiation." The Church holds that the body and blood of Jesus can no longer be truly separated. Where one is, the other must be. Therefore, although the priest (or extraordinary minister of Holy Communion) says "The Body of Christ" when administering the Host and "The Blood of Christ" when presenting the chalice, the communicant who receives either one receives Christ, whole and entire. "The Eucharistic presence of Christ begins at the moment of the consecration and endures as long as the Eucharistic species subsist. Christ is present whole and entire in each of the species and whole and entire in each of their parts, in such a way that the breaking of the bread does not divide Christ." The Roman Catholic Church sees as the main basis for this belief the words of Jesus himself at his Last Supper: the Synoptic Gospels (Matthew 26:26–28; Mark 14:22–24; Luke 22:19–20) and Saint Paul's 1 Cor. 11:23–25 recount that in that context Jesus said of what to all appearances were bread and wine: "This is my body … this is my blood." 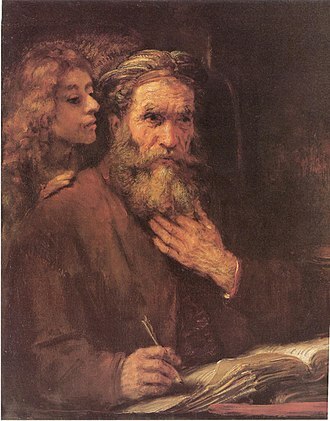 The Catholic understanding of these words, from the Patristic authors onward, has emphasized their roots in the covenantal history of the Old Testament. The interpretation of Christ's words against this Old Testament background coheres with and supports belief in the Real presence of Christ in the Eucharist. In 1551, the Council of Trent definitively declared, "Because Christ our Redeemer said that it was truly his body that he was offering under the species of bread,[Jn. 6:51] it has always been the conviction of the Church of God, and this holy Council now declares again that by the consecration of the bread and wine there takes place a change of the whole substance of the bread into the substance of the body of Christ our Lord and of the whole substance of the wine into the substance of his blood. This change the holy Catholic Church has fittingly and properly called transubstantiation." The Fourth Council of the Lateran in 1215 had spoken of "Jesus Christ, whose body and blood are truly contained in the sacrament of the altar under the forms of bread and wine, the bread being changed (transsubstantiatis) by divine power into the body and the wine into the blood. "[note 6] The attempt by some twentieth-century Catholic theologians to present the Eucharistic change as an alteration of significance (transignification rather than transubstantiation) was rejected by Pope Paul VI in his 1965 encyclical letter Mysterium fidei. In his 1968 Credo of the People of God, he reiterated that any theological explanation of the doctrine must hold to the twofold claim that, after the consecration, 1) Christ's body and blood are really present; and 2) bread and wine are really absent; and this presence and absence is real and not merely something in the mind of the believer. On entering a church, Latin Church Catholics genuflect to the tabernacle that holds the consecrated host in order to respectfully acknowledge the presence of Jesus in the Blessed Sacrament, a presence signalled by a sanctuary lamp or votive candle kept burning close to such a tabernacle. (If there is no such burning light, it indicates that the tabernacle is empty of the special presence of Jesus in the Eucharist.) Catholics will also often kneel or sit before the tabernacle, when the sanctuary light is lit, to pray directly to Jesus, materially present in the form of the Eucharist. Similarly, the consecrated Eucharistic host—the unleavened bread—is sometimes exposed on the altar, usually in an ornamental fixture called a Monstrance, so that Catholics may pray or contemplate in the direct presence and in direct view of Jesus in the Eucharist; this is sometimes called "exposition of the Blessed Sacrament", and the prayer and contemplation in front of the exposed Eucharist are often called "adoration of the Blessed Sacrament" or just "adoration". All of these practices stem from belief in the Real Presence of Jesus Christ in the Eucharist, which is an essential Article of Faith of the Catholic Church. Within Eastern Christianity, the Eucharistic service is called the Divine Liturgy (Byzantine Rite) or similar names in other rites. It comprises two main divisions: the first is the Liturgy of the Catechumens which consists of introductory litanies, antiphons and scripture readings, culminating in a reading from one of the Gospels and, often, a homily; the second is the Liturgy of the Faithful in which the Eucharist is offered, consecrated, and received as Holy Communion. Within the latter, the actual Eucharistic prayer is called the anaphora, literally: "offering" or "carrying up" (ἀνα- + φέρω). In the Rite of Constantinople, two different anaphoras are currently used: one is attributed to Saint John Chrysostom, the other to Saint Basil the Great. In the Oriental Orthodox Church, a variety of anaphoras are used, but all are similar in structure to those of the Constantinopolitan Rite, in which the Anaphora of Saint John Chrysostom is used most days of the year; Saint Basil's is offered on the Sundays of Great Lent, the eves of Christmas and Theophany, Holy Thursday, Holy Saturday, and upon his feast day (1 January). At the conclusion of the Anaphora the bread and wine are held to be the Body and Blood of Christ. Unlike the Latin Church, the Byzantine Rite uses leavened bread, with the leaven symbolizing the presence of the Holy Spirit. The Armenian Apostolic Church, like the Latin Church, uses unleavened bread, whereas the Greek Orthodox Church utilizes leavened bread in their celebration. Conventionally this change in the elements is understood to be accomplished at the Epiclesis ("invocation") by which the Holy Spirit is invoked and the consecration of the bread and wine as the true and genuine Body and Blood of Christ is specifically requested, but since the anaphora as a whole is considered a unitary (albeit lengthy) prayer, no one moment within it can be readily singled out. The so-called 'Black Rubric' in the 1552 Prayer Book which allowed kneeling for communion but denied the real and essential presence of Christ in the elements was omitted in the 1559 edition. It was re-instated in the 1662 Book modified to deny any corporeal presence to suggest Christ was present in his natural Body. The bread and wine are held to be outward symbols of an inward and spiritual grace received by the faithful as the instruments of God's grace and Jesus' self-offering to the communicant. In most parishes of the Anglican Communion the Eucharist is celebrated every Sunday, having replaced Morning Prayer as the principal service. The rites for the Eucharist are found in the various prayer books of the Anglican churches. Wine and unleavened wafers or unleavened bread is used. Daily celebrations are the norm in many cathedrals and parish churches sometimes offer one or more services of Holy Communion during the week. The nature of the liturgy varies according to the theological tradition of the priests, parishes, dioceses and regional churches. The bread and "fruit of the vine" indicated in Matthew, Mark and Luke as the elements of the Lord's Supper are interpreted by many Baptists as unleavened bread (although leavened bread is often used) and, in line with the historical stance of some Baptist groups (since the mid-19th century) against partaking of alcoholic beverages, grape juice, which they commonly refer to simply as "the Cup". The unleavened bread also underscores the symbolic belief attributed to Christ's breaking the bread and saying that it was his body. A soda cracker is often used. Most Baptists consider the Communion to be primarily an act of remembrance of Christ's atonement, and a time of renewal of personal commitment. However, with the rise of confessionalism, some Baptists have denied the Zwinglian doctrine of mere memorialism and have taken up a Reformed view of Communion. Confessional Baptists believe in pneumatic presence, which is expressed in the Second London Baptist Confession, specifically in Chapter 30, Articles 3 and 7. This view is prevalent among Southern Baptists, those in the Founders movement (a Calvinistic movement within the some Independent Baptists, Freewill Baptists, and several individuals in other Baptist associations. Communion practices and frequency vary among congregations. A typical practice is to have small cups of juice and plates of broken bread distributed to the seated congregation. In other congregations, communicants may proceed to the altar to receive the elements, then return to their seats. A widely accepted practice is for all to receive and hold the elements until everyone is served, then consume the bread and cup in unison. Usually, music is performed and Scripture is read during the receiving of the elements. Some Baptist churches are closed-Communionists (even requiring full membership in the church before partaking), with others being partially or fully open-Communionists. It is rare to find a Baptist church where The Lord's Supper is observed every Sunday; most observe monthly or quarterly, with some holding Communion only during a designated Communion service or following a worship service. Adults and children in attendance, who have not made a profession of faith in Christ, are expected to not participate. Lutherans believe that the body and blood of Christ are "truly and substantially present in, with, and under the forms" of the consecrated bread and wine (the elements), so that communicants eat and drink the body and blood of Christ himself as well as the bread and wine in this sacrament. The Lutheran doctrine of the Real Presence is more accurately and formally known as the "sacramental union". It has been called "consubstantiation" by non-Lutherans. This term is specifically rejected by Lutheran churches and theologians since it creates confusion about the actual doctrine and subjects the doctrine to the control of a non-biblical philosophical concept in the same manner as, in their view, does the term "transubstantiation". While an official movement exists in Lutheran congregations to celebrate Eucharist weekly, using formal rites very similar to the Catholic and "high" Anglican services, it was historically common for congregations to celebrate monthly or even quarterly. Even in congregations where Eucharist is offered weekly, there is not a requirement that every church service be a Eucharistic service, nor that all members of a congregation must receive it weekly. Traditional Mennonite and German Baptist Brethren Churches such as the Church of the Brethren churches and congregations have the Agape Meal, footwashing and the serving of the bread and wine two parts to the Communion service in the Lovefeast. In the more modern groups, Communion is only the serving of the Lord's Supper. In the communion meal, the members of the Mennonite churches renew their covenant with God and with each other. Among Open assemblies, also termed Plymouth Brethren, the Eucharist is more commonly called the Breaking of Bread or the Lord's Supper. It is seen as a symbolic memorial and is central to the worship of both individual and assembly. In principle, the service is open to all baptized Christians, but an individual's eligibility to participate depends on the views of each particular assembly. The service takes the form of non-liturgical, open worship with all male participants allowed to pray audibly and select hymns or readings. The breaking of bread itself typically consists of one leavened loaf, which is prayed over and broken by a participant in the meeting and then shared around. 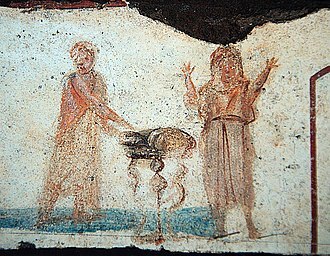 The wine is poured from a single container into one or several vessels, and these are again shared around. The Exclusive Brethren follow a similar practice to the Open Brethren. They also call the Eucharist the Breaking of Bread or the Lord's Supper. In the Reformed Churches the Eucharist is variously administered. The Calvinist view of the Sacrament sees a real presence of Christ in the supper which differs both from the objective ontological presence of the Catholic view, and from the real absence of Christ and the mental recollection of the memorialism of the Zwinglians and their successors. The bread and wine become the means by which the believer has real communion with Christ in his death and Christ's body and blood are present to the faith of the believer as really as the bread and wine are present to their senses but this presence is "spiritual", that is the work of the Holy Spirit. There is no standard frequency; John Calvin desired weekly communion, but the city council only approved monthly, and monthly celebration has become the most common practice in Reformed churches today. Many, on the other hand, follow John Knox in celebration of the Lord's supper on a quarterly basis, to give proper time for reflection and inward consideration of one's own state and sin. 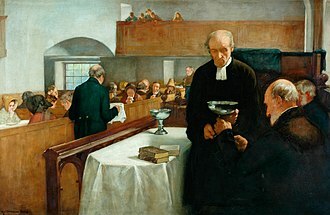 Recently, Presbyterian and Reformed Churches have been considering whether to restore more frequent communion, including weekly communion in more churches, considering that infrequent communion was derived from a memorialist view of the Lord's Supper, rather than Calvin's view of the sacrament as a means of grace. Some churches use bread without any raising agent (whether leaven or yeast), in view of the use of unleavened bread at Jewish Passover meals, while others use any bread available. The Presbyterian Church (USA), for instance, prescribes "bread common to the culture". Harking back to the regulative principle of worship, the Reformed tradition had long eschewed coming forward to receive communion, preferring to have the elements distributed throughout the congregation by the presbyters (elders) more in the style of a shared meal. Over the last half a century it is much more common in Presbyterian churches to have Holy Communion monthly or on a weekly basis. It is also becoming common to receive the elements by intinction (receiving a piece of consecrated bread or wafer, dipping it in the blessed wine, and consuming it) Wine and grape juice are both used, depending on the congregation. Most Reformed churches practice open communion", i.e., all believers who are united to a church of like faith and practice, and who are not living in sin, would be allowed to join in the Sacrament. Reflecting Wesleyan covenant theology, Methodists also believe that the Lord's Supper is a sign and seal of the covenant of grace. In many Methodist denominations, non-alcoholic wine (grape juice) is used, so as to include those who do not take alcohol for any reason, as well as a commitment to the Church's historical support of temperance. Variations of the Eucharistic Prayer are provided for various occasions, including communion of the sick and brief forms for occasions that call for greater brevity. Though the ritual is standardized, there is great variation amongst Methodist churches, from typically high-church to low-church, in the enactment and style of celebration. Methodist clergy are not required to be vested when celebrating the Eucharist. John Wesley, a founder of Methodism, said that it was the duty of Christians to receive the sacrament as often as possible. Methodists in the United States are encouraged to celebrate the Eucharist every Sunday, though it is typically celebrated on the first Sunday of each month, while a few go as long as celebrating quarterly (a tradition dating back to the days of circuit riders that served multiple churches). 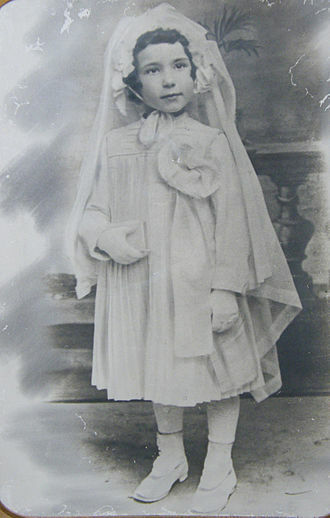 Communicants may receive standing, kneeling, or while seated. Gaining more wide acceptance is the practice of receiving by intinction (receiving a piece of consecrated bread or wafer, dipping it in the blessed wine, and consuming it). The most common alternative to intinction is for the communicants to receive the consecrated juice using small, individual, specially made glass or plastic cups known as communion cups. The United Methodist Church practices open communion, inviting "all who intend a Christian life, together with their children" to receive Communion. Many non-denominational Christians, including the Churches of Christ, receive communion every Sunday. Others, including Evangelical churches such as the Church of God, Calvary Chapel, and many forms of Baptist, typically receive communion on a monthly or periodic basis. Many non-denominational Christians hold to the Biblical autonomy of local churches and have no universal requirement among congregations. Some Churches of Christ, among others, use grape juice and unleavened wafers or unleavened bread and practice open communion. Holy Qurbana or Qurbana Qadisha, the "Holy Offering" or "Holy Sacrifice", refers to the Eucharist as celebrated according to the East Syrian and West Syrian traditions of Syriac Christianity. The main Anaphora of the East Syrian tradition is the Holy Qurbana of Addai and Mari, while that of the West Syrian tradition is the Liturgy of Saint James. Both are extremely old, going back at least to the third century, and are the oldest extant liturgies continually in use. In the Seventh-day Adventist Church the Holy Communion service customarily is celebrated once per quarter. The service includes the ordinance of footwashing and the Lord's Supper. Unleavened bread and unfermented (non-alcoholic) grape juice is used. Open communion is practised: all who have committed their lives to the Saviour may participate. The communion service must be conducted by an ordained pastor, minister or church elder. The Christian Congregation of Jehovah's Witnesses commemorates Christ's death as a ransom or propitiatory sacrifice by observing a Memorial annually on the evening that corresponds to the Passover, Nisan 14, according to the ancient Jewish calendar. They refer to this observance generally as the "Lord's Evening Meal" or the "Memorial of Christ's Death". They believe that this is the only annual religious observance commanded for Christians in the Bible. Of those who attend the Memorial a small minority worldwide partake of the wine and unleavened bread. Jehovah's Witnesses believe that only 144,000 people will receive heavenly salvation and immortal life and thus spend eternity with God and Christ in heaven, as under-priests and co-rulers under Christ the King and High Priest, in Jehovah's Kingdom. Paralleling the anointing of kings and priests, they are referred to as the "anointed" class and are the only ones who should partake of the bread and wine. They believe that the baptized "other sheep" of Christ's flock also benefit from the ransom sacrifice, and are respectful observers and viewers of the Lord's Supper remembrance at these special meetings of Jehovah's witnesses, with hope of receiving everlasting life in Paradise restored on a "New Earth". The Memorial, held after sundown, includes a sermon on the meaning and importance of the celebration and gathering, and includes the circulation and viewing among the audience of unadulterated red wine and unleavened bread (matzo). Jehovah's Witnesses believe that the bread symbolizes and represents Jesus Christ's perfect body which he gave on behalf of mankind, and that the wine represents his perfect blood which he shed at Calvary and redeems fallen man from inherited sin and death. The wine and the bread (sometimes referred to as "emblems") are viewed as symbolic and commemorative; the Witnesses do not believe in transubstantiation or consubstantiation; so not a literal presence of flesh and blood in the emblems, but that the emblems are simply sacred symbolisms, denoting spiritual and sacred realities. In The Church of Jesus Christ of Latter-day Saints (LDS Church), the "Holy Sacrament of the Lord's Supper", more simply referred to as the Sacrament, is administered every Sunday (except General Conference or other special Sunday meeting) in each LDS Ward or branch worldwide at the beginning of Sacrament meeting. The Sacrament, which consists of both ordinary bread and water (rather than wine or grape juice), is prepared by priesthood holders prior to the beginning of the meeting. At the beginning of the Sacrament, priests say specific prayers to bless the bread and water. The Sacrament is passed row-by-row to the congregation by priesthood holders (typically deacons). While the Salvation Army does not reject the Eucharistic practices of other churches or deny that their members truly receive grace through this sacrament, it does not practice the sacraments of Communion or baptism. This is because they believe that these are unnecessary for the living of a Christian life, and because in the opinion of Salvation Army founders William and Catherine Booth, the sacrament placed too much stress on outward ritual and too little on inward spiritual conversion. Emphasizing the inward spiritual experience of their adherents over any outward ritual, Quakers (members of the Religious Society of Friends) generally do not baptize or observe Communion. Christian denominations differ in their understanding of whether they may receive the Eucharist with those with whom they are not in full communion. The famed apologist St. Justin Martyr (c. 150) wrote: "No one else is permitted to partake of it, except one who believes our teaching to be true...." For the first several hundred years, non-members were forbidden even to be present at the sacramental ritual; visitors and catechumens (those still undergoing instruction) were dismissed halfway through the Liturgy, after the Bible readings and sermon but before the Eucharistic rite. 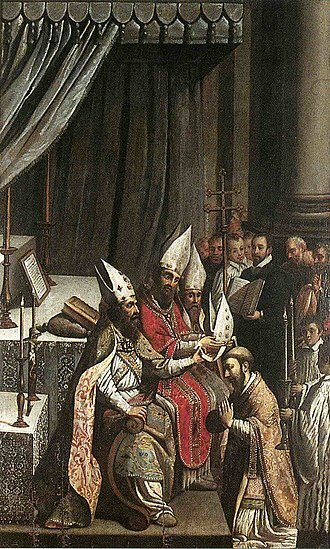 This ancient custom is still evident in the extraordinary form of the Roman Rite, where the Mass is divided into two parts: the Mass of the Catechumens, and the Mass of the Faithful; and likewise in the ordinary form of the Roman Rite, where the Mass is divided into the Liturgy of the Word and the Liturgy of the Eucharist. The Divine Liturgy of St. John Chrysostom, used in the Byzantine Rite, still has a formula of dismissal of catechumens (not usually followed by any action) at this point. Likewise, the ordinary form of the Roman Rite permits the dismissal of catechumens at the usual opportunity,[clarification needed] but makes this wholly optional; it is no longer essential to the rite. 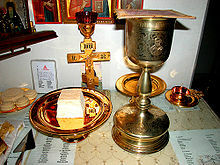 Churches such as the Roman Catholic and the Eastern Orthodox Churches practice closed communion under normal circumstances. However, the Catholic Church allows administration of the Eucharist, at their spontaneous request, to properly disposed members of the eastern churches (Eastern Orthodox, Oriental Orthodox and Church of the East) not in full communion with it and of other churches that the Holy See judges to be sacramentally in the same position as these churches; and in grave and pressing need, such as danger of death, it allows the Eucharist to be administered also to individuals who do not belong to these churches but who share the Catholic Church's faith in the reality of the Eucharist and have no access to a minister of their own community. Some Protestant communities exclude non-members from Communion. 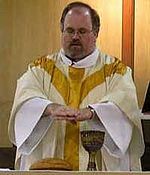 The Evangelical Lutheran Church in America (ELCA) practices open communion, provided those who receive are baptized, but the Lutheran Church–Missouri Synod and the Wisconsin Evangelical Lutheran Synod (WELS) practice closed communion, excluding non-members and requiring communicants to have been given catechetical instruction. The Evangelical Lutheran Church in Canada, the Evangelical Church in Germany, the Church of Sweden, and many other Lutheran churches outside of the US also practice open communion. Some use the term "close communion" for restriction to members of the same denomination, and "closed communion" for restriction to members of the local congregation alone. Most Protestant communities including Congregational churches, the Church of the Nazarene, the Assemblies of God, Methodists, most Presbyterians, Anglicans, and Churches of Christ and other non-denominational churches practice various forms of open communion. Some churches do not limit it to only members of the congregation, but to any person in attendance (regardless of Christian affiliation) who considers himself/herself to be a Christian. 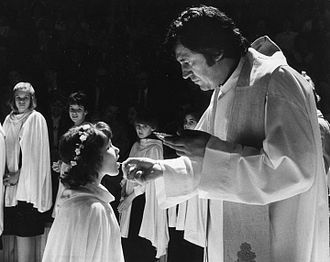 Others require that the communicant be a baptized person, or a member of a church of that denomination or a denomination of "like faith and practice". Some Progressive Christian congregations offer communion to any individual who wishes to commemorate the life and teachings of Christ, regardless of religious affiliation. In the Episcopal Church (United States), those who do not receive Holy Communion may enter the communion line with their arms crossed over their chest, in order to receive a blessing from the priest, instead of receiving Holy Communion. As a matter of local convention, this practice can also be found in Roman Catholic churches in the United States for Catholics who find themselves, for whatever reason, not in a position to receive the Eucharist itself, as well as for non-Catholics, who are not permitted to receive it. Most Latter-Day Saint churches practice closed communion; one notable exception is the Community of Christ, the second-largest denomination in this movement. While The Church of Jesus Christ of Latter-day Saints (the largest of the LDS denominations) technically practice a closed communion, their official direction to local Church leaders (in Handbook 2, section 20.4.1, last paragraph) is as follows: "Although the sacrament is for Church members, the bishopric should not announce that it will be passed to members only, and nothing should be done to prevent nonmembers from partaking of it." The Catholic Church requires its members to receive the sacrament of Penance or Reconciliation before taking Communion if they are aware of having committed a mortal sin and to prepare by fasting, prayer, and other works of piety. Traditionally, the Eastern Orthodox church has required its members to have observed all church-appointed fasts (most weeks, this will be at least Wednesday and Friday) for the week prior to partaking of communion, and to fast from all food and water from midnight the night before. In addition, Orthodox Christians are to have made a recent confession to their priest (the frequency varying with one's particular priest), and they must be at peace with all others, meaning that they hold no grudges or anger against anyone. In addition, one is expected to attend Vespers or the All-Night Vigil, if offered, on the night before receiving communion. Furthermore, various pre-communion prayers have been composed, which many (but not all) Orthodox churches require or at least strongly encourage members to say privately before coming to the Eucharist. Many Protestant congregations generally reserve a period of time for self-examination and private, silent confession just before partaking in the Lord's Supper. Seventh-day Adventists, Mennonites, and some other groups participate in "foot washing" (cf. John 13:3–17) as a preparation for partaking in the Lord's Supper. At that time they are to individually examine themselves, and confess any sins they may have between one and another. Eucharistic adoration is a practice in the Roman Catholic, Anglo-Catholic and some Lutheran traditions, in which the Blessed Sacrament is exposed to and adored by the faithful. When this exposure and adoration is constant (twenty-four hours a day), it is called Perpetual Adoration. In a parish, this is usually done by volunteer parishioners; in a monastery or convent, it is done by the resident monks or nuns. In the Exposition of the Blessed Sacrament, the Eucharist is displayed in a monstrance, typically placed on an altar, at times with a light focused on it, or with candles flanking it. The gluten in wheat bread is dangerous to people with celiac disease and other gluten-related disorders, such as non-celiac gluten sensitivity and wheat allergy. For the Catholic Church, this issue was addressed in the 24 July 2003 letter of the Congregation for the Doctrine of the Faith, which summarized and clarified earlier declarations. The Catholic Church believes that the matter for the Eucharist must be wheaten bread and fermented wine from grapes: it holds that, if the gluten has been entirely removed, the result is not true wheaten bread. For celiacs, but not generally, it allows low-gluten bread. It also permits Holy Communion to be received under the form of either bread or wine alone, except by a priest who is celebrating Mass without other priests or as principal celebrant. Many Protestant churches offer communicants gluten-free alternatives to wheaten bread, usually in the form of a rice-based cracker or gluten-free bread. The Catholic Church believes that grape juice that has not begun even minimally to ferment cannot be accepted as wine, which it sees as essential for celebration of the Eucharist. For alcoholics, but not generally, it allows the use of mustum (grape juice in which fermentation has begun but has been suspended without altering the nature of the juice), and it holds that "since Christ is sacramentally present under each of the species, communion under the species of bread alone makes it possible to receive all the fruit of Eucharistic grace. For pastoral reasons, this manner of receiving communion has been legitimately established as the most common form in the Latin rite." As already indicated, the one exception is in the case of a priest celebrating Mass without other priests or as principal celebrant. The water that in the Latin Church is prescribed to be mixed with the wine must be only a relatively small quantity. The practice of the Coptic Church is that the mixture should be two parts wine to one part water. Many Protestant churches allow clergy and communicants to take mustum instead of wine. In addition to, or in replacement of wine, some churches offer grape juice which has been pasteurized to stop the fermentation process the juice naturally undergoes; de-alcoholized wine from which most of the alcohol has been removed (between 0.5% and 2% remains), or water. Exclusive use of unfermented grape juice is common in Baptist churches, the United Methodist Church, Seventh-day Adventists, Christian Churches/Churches of Christ, Churches of Christ, Church of God (Anderson, Indiana) some Lutherans, Assemblies of God, Pentecostals, Evangelicals, the Christian Missionary Alliance, and other American independent Protestant churches. Risk of infectious disease transmission related to use of a common communion cup is low, to the point of being undetectable. No case of transmission of an infectious disease related to a common communion cup has ever been documented. The most likely diseases to be transmitted would be common viral illnesses such as the common cold, but a study of 681 individuals found that taking communion up to daily from a common cup did not increase the risk of infection beyond that of those who did not attend services at all. In influenza epidemics, some churches suspend the giving of communion under the form of wine, for fear of spreading the disease. This is in full accord with Catholic Church belief that communion under the form of bread alone makes it possible to receive all the fruit of Eucharistic grace. However, the same measure has also been taken by churches that normally insist on the importance of receiving communion under both forms. This was done in 2009 by the Church of England. Some fear contagion through the handling involved in distributing the hosts to the communicants, even if they are placed on the hand rather than on the tongue. Accordingly, some churches use mechanical wafer dispensers or "pillow packs" (communion wafers with wine inside them). While these methods of distributing communion are not accepted in Catholic Church parishes, one such church provides a mechanical dispenser to allow those intending to communicate to place in a bowl, without touching them by hand, the hosts for use in the celebration. ^ Within Oriental Orthodoxy, the "Oblation" is the term used in the Syrian, Coptic and Armenian churches, while "Consecration" is used in the Ethiopian Orthodox Tewahedo Church. "Oblation" and "Consecration" are of course used also by the Eastern Catholic Churches that are of the same liturgical tradition as these churches. Likewise, in the Gaelic language of Ireland and Scotland the word "Aifreann", usually translated into English as "Mass", is derived from Late Latin "Offerendum", meaning "oblation", "offering". ^ 14.1 But every Lord's day do ye gather yourselves together, and break bread, and give thanksgiving after having confessed your transgressions, that your sacrifice may be pure. 14.2. But let no one that is at variance with his fellow come together with you, until they be reconciled, that your sacrifice may not be profaned. 14.3. For this is that which was spoken by the Lord: In every place and time offer to me a pure sacrifice; for I am a great King, saith the Lord, and my name is wonderful among the nations. 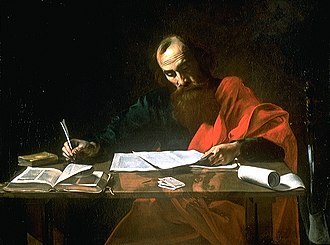 ^ The tradition that Ignatius was a direct disciple of the Apostle John is consistent with the content of his letters. ^ Canon 1. A misprint in this source gives "transubstantiatio" in place of "transubstantiatis" of the original: "Iesus Christus, cuius corpus et sanguis in sacramento altaris sub speciebus panis et vini veraciter continentur, transsubstantiatis pane in corpus, et vino in sanguinem potestate divina"
^ a b A Catechism for the use of people called Methodists. Peterborough, England: Methodist Publishing House. 2000. p. 26. ISBN 978-1858521824. ^ a b "Christianity: Eucharist". BBC. 23 June 2009. Retrieved 22 May 2017. ^ Mattox, Mickey L.; Roeber, A. G. (27 February 2012). Changing Churches: An Orthodox, Catholic, and Lutheran Theological Conversation. Wm. B. Eerdmans Publishing. p. 54. ISBN 9780802866943. In this "sacramental union," Lutherans taught, the body and blood of Christ are so truly united to the bread and wine of the Holy Communion that the two may be identified. They are at the same time body and blood, bread and wine. This divine food is given, more-over, not just for the strengthening of faith, nor only as a sign of our unity in faith, nor merely as an assurance of the forgiveness of sin. Even more, in this sacrament the Lutheran Christian receives the very body and blood of Christ precisely for the strengthening of the union of faith. The "real presence" of Christ in the Holy Sacrament is the means by which the union of faith, effected by God's Word and the sacrament of baptism, is strengthened and mantained. Intimate union with Christ, in other words, leads directly to the most intimate communion in his holy body and blood. ^ McKim, Donald K. (11 March 1998). Major Themes in the Reformed Tradition. Wipf and Stock Publishers. p. 263. ISBN 9781579101046. ^ Richardson, Alan. Introduction to the Theology of the New Testament. London: SCM. p. 364. ^ Bayne, Brian L. (1974). "Plymouth Brethren". In Cross, F. L.; Livingstone, E. A. The Oxford Dictionary of the Christian Church; Nature. 329. Oxford University Press. p. 578. Bibcode:1987Natur.329..578B. doi:10.1038/329578b0. PMID 3309679. ^ Catholic Church (2006). Compendium of the Catechism of the Catholic Church. Libreria Editrice Vaticana. p. 275. , and Catholic Church (1997). Catechism of the Catholic Church. pp. 1328–32. ISBN 978-1574551105. ^ Oxford English Dictionary, s.v. "mass". ^ "Concluding Rites". www.usccb.org. Retrieved 14 September 2018. ^ Spicer, Andrew (5 December 2016). Lutheran Churches in Early Modern Europe. Routledge. p. 185. ISBN 978-1351921169. ^ Kellerman, James. "The Lutheran Way of Worship". First Bethlehem Lutheran Church. Retrieved 12 June 2017. ^ Moloney, Francis (2001). "A Hard Saying" : The Gospel and Culture. The Liturgical Press. pp. 109–30. ^ "Catechism of the Catholic Church". www.vatican.va. Retrieved 14 September 2018. ^ Tyndale Bible Dictionary / editors, Philip W. Comfort, Walter A. Elwell, 2001 ISBN 0842370897, article: "John, Gospel of"
^ "Eucharist and Gospel of John". VatiKos Theologie. 2013-10-11. Archived from the original on 2013-10-15. Retrieved 2017-12-10. ^ Lambert, J.C. (1978). The International Standard Bible Encyclopedia (reprint ed.). Wm. B. Eerdmans Publishing Co. ISBN 978-0802880451. ^ Horton, Michael S. (2008). People and Place: A Covenant Ecclesiology. Louisville, KY: Westminster John Knox Press. p. 126. ISBN 978-0664230715. ^ Lumen gentium 11. Retrieved 1 January 2019. ^ Presbyterorum ordinis 5. Retrieved 1 January 2019. ^ "Compendium of the Catechism of the Catholic Church". www.vatican.va. Retrieved 28 December 2018. ^ "General Instruction of the Roman Missal, 7,8". www.vatican.va. Retrieved 2019-02-27. ^ Fides, P. S. (1989). Past Event and Present Salvation. p. 71. ISBN 066425036X. ^ Mulcahy, E (2007). Cause Of Our Salvation. Gregorian & Biblical Press. ISBN 8878390801. ^ Daly, Robert (March 2003). "Sacrifice Unveiled or Sacrifice Revisited". Theological Studies. ^ Brown, Raymond E.; et al. (1989). New Jerome Biblical Commentary, 82: 73. Pearson. ISBN 0136149340. ^ Kasper, Walter (1977). Jesus the Christ. Mahwah, New Jersey: Paulist. p. 120. ISBN 0860120589. ^ Ratzinger, Joseph (2004). Introduction to Christianity. Ignatius Press. pp. 219–220. ISBN 978-1-58617-029-5. ^ "The Real Presence of Jesus Christ in the Sacrament of the Eucharist: Basic Questions and Answers". United States Conference of Catholic Bishops. United States Conference of Catholic Bishops. Retrieved 4 January 2017. ^ Aquinas, Thomas. "Summa Theologiæ Article 2". New Advent. Retrieved 4 January 2017. ^ "Catechism of the Catholic Church". The Holy See. The Catholic Church. Retrieved 4 January 2017. ^ Mulcahy, O.P., Bernard. "The Holy Eucharist" (PDF). kofc.org. Knights of Columbus. Retrieved 4 January 2017. ^ Aquinas, Thomas. "Summa Theologiae, Question 77". New Advent. Kevin Knight. Retrieved 4 January 2017. ^ Under Julius III Council of Trent Session 13 CHAPTER IV. Retrieved 19 December 2018. ^ "Catechism of the Catholic Church - The sacrament of the Eucharist #1377". www.vatican.va. Retrieved 28 December 2018. ^ "Abrahamic, Mosaic, and Prophetic Foundations of the Eucharist". Inside the Vatican 16, no. 4 (2008): 102–105. ^ Runciman, Steven (1968). The Great Church in Captivity. Cambridge University Press. p. 90. ISBN 978-0521313100. ^ Why do the Orthodox use leavened bread since leaven is a symbol of sin? 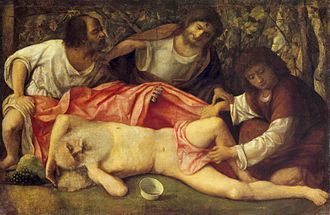 Is not Christ’s body sinless? - orthodoxanswers.org. Retrieved 26 August 2018. ^ See, e.g., Graves, J. R. (1928). What is It to Eat and Drink Unworthily. Baptist Sunday School Committee. OCLC 6323560. ^ F. L. Cross, ed., The Oxford Dictionary of the Christian Church, second edition, (Oxford: Oxford University Press, 1974), 340 sub loco. ^ J. T. Mueller, Christian Dogmatics: A Handbook of Doctrinal Theology, (St. Louis: CPH, 1934), 519; cf. also Erwin L. Lueker, Christian Cyclopedia, (St. Louis: CPH, 1975), under the entry "consubstantiation". ^ What Lutherans Believe About Holy Communion Archived 20 March 2011 at the Wayback Machine. Retrieved 2011–04–25. ^ How Lutherans Worship Archived 24 March 2011 at the Wayback Machine at LutheransOnline.com. Retrieved 2011–04–24. ^ "Ordinances". GAMEO. 24 August 2013. Retrieved 11 October 2013. ^ D. G. Hart and John R. Muether (October 1997). "The Lord's Supper: How Often?". Ordained Servant. 6 (4). ^ a b Abraham, William J.; Watson, David F. (2013). Key United Methodist Beliefs. Abingdon Press. pp. 103–04. ISBN 978-1426756610. Charles Wesley wrote a marvelous collection of hymns that offer an amazing vision of Christ's mysterious, yet real, presence in the bread and the wine. Here is a stanza from one of them: We need not now go up to Heaven, To bring the long sought Saviour down; Thou art to all already given, Thou dost e’en now Thy banquet crown: To every faithful soul appear, And show Thy real presence here! ^ Crowther, Jonathan (1815). A Portraiture of Methodism. p. 224. The Methodists believe, that the covenant of grace has been administered and renewed in different ages of the world. ... Under the gospel, Christ the substance, prefigured by these shadows, being exhibited, the ordinances in and by which this covenant is dispensed, are the preaching of the word, and the administration of the sacraments of baptism and the Lord's Supper: which ordinances, though fewer in number, and administered with more simplicity, and less external glory, yet hold forth this covenant in greater fulness, evidence, and spiritual efficacy to all nations, both Jews and Gentiles. ^ Watson, Richard (1852). An exposition of the gospels of St. Matthew and St. Mark: and some other detached parts of Holy Scripture. George Lane & Levi Scott. p. 282. This covenant, the blood of Christ, that is, the pouring forth of his blood as a sacrficial victim, at once procured and ratified; so that it stands firm to all truly penitent and contrite spirits who believe in him: and of this great truth, the Lord's Supper was the instituted sign and seal; and he who in faith drinks of the cup, having reference to its signification, that blood of Christ which confirms to true believers the whole covenant of grace, is assured thereby of its faithfulness and permanence, and derives to himself the fulness of its blessings. ^ "Alcohol". Methodist Church of Great Britain. Retrieved 10 November 2017. ^ "... the use of unfermented grape juice by The United Methodist Church ... expresses pastoral concern for recovering alcoholics, enables the participation of children and youth, and supports the church's witness of abstinence". ^ Communion Cups, 1000 from Broadman / Holman Church Supply. Christianbook.com. Accessed 5 July 2009. ^ Seventh-day Adventist Church Manual, 17th edition, 2005, pp. 81–86. Published by the secretariat, General Conference of Seventh-day Adventists. ^ Reasoning From The Scriptures, Watch Tower Bible & Tract Society, 1989, p. 265. ^ Insight On The Scriptures, Watch Tower Bible & Tract Society, 1988, p. 392. ^ "Jehovah is a God of Covenants", The Watchtower, February 1, 1998, p. 8, "Jesus instituted the only annual religious observance commanded for Christians—the Memorial of his death." ^ a b What Does the Bible Really Teach?. Watch Tower Society. p. 207. ^ "Discerning What We Are – At Memorial Time", The Watchtower, February 15, 1990, p. 16. ^ See, e.g., Roberts, B. H. (1938). Comprehensive History of The Church of Jesus Christ of Latter-day Saints. Deseret News Press. OCLC 0842503005. ^ "Doctrine and Covenants 20:75". LDS Church. Retrieved 2009-06-19. ^ "Handbook 2: Administering the Church, Chapter 20.4.3". Retrieved 2011-10-30. ^ "Moroni 4". www.lds.org. Retrieved 14 September 2018. ^ "Moroni 5". www.lds.org. Retrieved 14 September 2018. ^ "The Restoration of the Sacrament". www.lds.org. Retrieved 14 September 2018. ^ Why Does the Salvation Army Not Baptize or Hold Communion Services? ^ How do Quakers Practice Baptism and Communion? ^ Evangelical Lutheran Archived 7 July 2011 at the Wayback Machine. Retrieved 2013–03–23. ^ "Close communion and membership". ^ "Guidelines for Congregational, District, and Synodical Communion Statements" www.lcms.org. Retrieved 2016–12–28. ^ The Episcopal Handbook. Church Publishing, Inc. 1 September 2008. ISBN 978-0819223296. Retrieved 25 June 2012. Pastoral blessings are often available for children or adults who are not communing. Simply cross your arms over your chest if you wish to receive a blessing. ^ "20. PRIESTHOOD ORDINANCES AND BLESSINGS". www.lds.org. Retrieved 14 September 2018. ^ Volta U, Caio G, De Giorgio R, Henriksen C, Skodje G, Lundin KE (Jun 2015). "Non-celiac gluten sensitivity: a work-in-progress entity in the spectrum of wheat-related disorders". Best Pract Res Clin Gastroenterol. 29 (3): 477–91. doi:10.1016/j.bpg.2015.04.006. PMID 26060112. A recently proposed approach to NCGS diagnosis is an objective improvement of gastrointestinal symptoms and extra-intestinal manifestations assessed through a rating scale before and after GFD. Although a standardized symptom rating scale is not yet applied worldwide, a recent study indicated that a decrease of the global symptom score higher than 50% after GFD can be regarded as confirmatory of NCGS (Table 1) . (…) After the confirmation of NCGS diagnosis, according to the previously mentioned work-up, patients are advized to start with a GFD . ^ McNamara, Father Edward (2004-09-14). "Gluten-free Hosts". ZENIT International News Agency. Retrieved 2008-04-22. ^ The same 24 July 2003 letter of the Congregation for the Doctrine of the Faith. ^ Jax Peter Lowell, The Gluten-Free Bible, p. 279. ^ Compare John Howard Spahr, I Smell the Cup Archived 21 September 2008 at the Wayback Machine, Christian Century, 12 March 1974, pp. 257–59. ^ Manangan, Lilia P.; Sehulster, Lynne M.; Chiarello, Linda; Simonds, Dawn N.; Jarvis, William R. (October 1998). "Risk of Infectious Disease Transmission from a Common Communion Cup". American Journal of Infection Control. 26 (5): 538–39. doi:10.1016/s0196-6553(98)70029-x. ^ Pellerin, J.; Edmond, M. B. (2013). "Infections associated with religious rituals". International Journal of Infectious Diseases. 17 (11): e945–48. doi:10.1016/j.ijid.2013.05.001. PMID 23791225. ^ Reddy, Sumathi (7 January 2011). "Hands Off After Wafer Scare". Wall Street Journal. Retrieved 2012-10-12. Aquinas, Thomas (1571). De venerabili sacramento altaris (pdf). archive.org (in Latin). Rome: Bibliotheca Vaticana. p. 4, 324 (of 452). (English translation: H.A Rawes (1871). The Bread of life: or St. Thomas Aquinas On the Adorable Sacrament of the Altar. Nevin, John Williamson. The Mystical Presence: A Vindication of the Reformed or Calvinistic Doctrine of the Holy Eucharist. 1846; Wipf & Stock reprint, 2000. ISBN 1579103480. Tissot, Very Rev. J. The Interior Life. 1916, pp. 347–49.